This week, London Local Team member Arati has written a guest blog post that gives us a behind the scenes look at how she makes her beautiful silk scarves. As a process that involves lots of skill, techniques and knowledge, you can see how these all come together to make a wearable piece of art! In every designer-maker’s life there are exciting challenges, but none so welcomed as that of making a customer’s vision into reality. When Saffie and Jack emailed me with a request to make a commemorative scarf for his mother Bridget’s 60th birthday, they had a general idea of what they wanted, and one very specific requirement – the scarf must feature the family’s dogs Iris and George – two beautiful lurchers. They sent me a rough sketch and a photograph of the dogs, so that I could get a feel of their vision. Having looked at the sketch and a few photographs of Bridget’s favourite flowers, I ‘photoshopped’ a couple of options and sent it back to them. After some back-and-forth discussions, we decided on a 90 centimetre square scarf, with the dogs running along the border, with gorse and ferns around the date of the special birthday in a sort of frame in the centre of the scarf. Working out the sample designs before getting started so Jack and Saffie had a general idea of what they would get, albeit a more painterly version, you can see we went through several versions before deciding a scarf with just two types of foliage and fewer colours would be more appropriate. 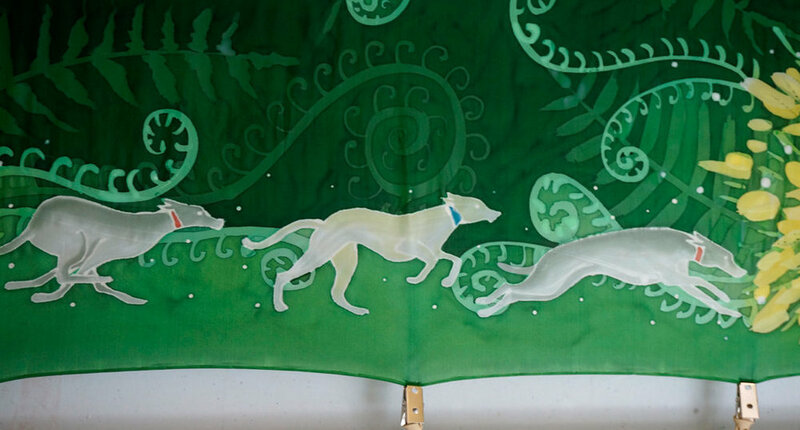 I got started by doing some research on running lurchers, and then neatly drawing the dogs in three different running positions ready to trace onto the silk. Next step, creating and printing out the text for the date to go in the centre. These steps are particularly important, because if I had drawn them freehand directly on the silk with resist and made a mistake, I would not have been able to correct it. Painting on the silk is pretty much permanent. Then, having washed the pre-hemmed scarf in mild detergent and soaked in vinegar, the dried scarf was stretched on a frame to keep it taut, almost like painting on canvas. Then it was time to get started on tracing the design onto the silk with temporary-ink pens, and adding resist – which, in my case, is the use of wax and gutta to restrict the flow of the liquid dye to create patterns. I used gutta (a water-based resist) to outline the dogs, and block out the text which was to remain white. Adding layers of yellow and then darker yellow dye and hot soy wax created the gorse flowers. Each time dye was applied, I waited for it to dry between applications of dye and wax. I also hand-mixed each colour of green – when working with dye, it’s important to remember that the colours are translucent… putting yellow over blue creates green, for example, and adding more colours over that will change the colours again. I work in reverse from light to dark, thinking ahead about what the end result will be. You can see in the images here that I began with a pale teal, added two different shades of green on top, and ended up with a rich forest green. Choosing the dye colours from my index cards, and heating up the eco-friendly soy wax. I added a layer of wax on top of the dogs to protect that area of dye from ‘accidents’ – often droplets of dye could drip from my brush, and once dye has touched the silk, it’s nearly impossible to cover up the error. Adding hot wax to protect the dogs from ‘accidents’ like dripping dye or splashes. The green shades were added after all the dogs, text and gorse flowers were done, to create a complex pattern of overlaid ferns, framing the date in the middle of the scarf. A layer of green dye was painted on and left to air dry. Then, one layer of ferns in hot soy wax to preserve that area of colour. Another layer of dye, and another layer of ferns in wax. And so on until it’s done. You can see the progression of layers of dye and wax in the following series of images. One last coat of green was added to the borders of the scarf on which I sprinkled rock salt, which is one of the most magical tools I use. When placed on top of wet dye, it ‘moves’ the dye creating random patterns. The two final stages of wax and dye layers. The one on the right has salt on the wet dye of the border. The image on the left shows the numerous of layers of wax I used. On the right, the salt on wet dye is creating patterns already. Brushing off the salt from the silk. Once the painting was complete, the scarf was left overnight to dry and to ‘rest’ the dyes. The last step was ironing off most of the wax onto paper. Ironing the wax off the silk. In order to make the scarf colourfast and handwash-able, it’s necessary to steam-fix the dyes by rolling the silk in layers of paper and suspending it for at least an hour (I do a lot more to be certain!) in a tube filled with very hot 80ºC steam. After the steaming, the silk rests again overnight, and then is hand washed in cool water with mild detergent and vinegar, to remove any excess dye or wax and ironed while still damp to remove any steamed-in creases. Taking the scarf out from papers after steam fixing the dye and hand washing in cool water. Almost done! The only printing technique I use in the whole process is to add my logo in the corner of the scarf, so that there is branding consistency across all my products. Printing my logo on the scarf. Then, I re-stretch the scarf on the frame, and put in a few fine details in silver gutta around the dogs and the text. And it is done! Ready to package and send off to its new owner. I hope you enjoyed seeing how a special birthday scarf like this one is made. It’s a long and careful process, but supremely enjoyable because of the end result and the joy it gives to the new owner. 10% off your order on both my website and etsy shop for readers of this blog post! Enter the code HAVEALOVELYDAY at checkout.